The next Thursday Scholarship Series concert will be held March 21 at 7:30 p.m. in Hodgson Concert Hall. 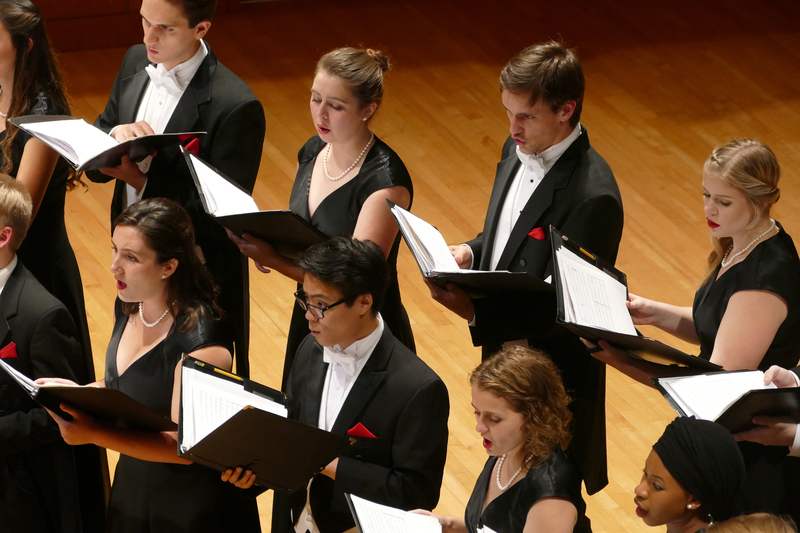 The Hodgson Singers, the University of Georgia’s premier choral ensemble, take the Hodgson Hall stage in the next Thursday Scholarship Series concert of the 2018-2019 season. Joining them will be the Atlanta Baroque Orchestra, a professional, early-music orchestra. The date of the concert, March 21, is significant as it is Johann Sebastian Bach’s birthday, and the concert will feature one of his most lauded works. Bach’s St. John Passion is a dramatic work that recounts Christ’s arrest, trial and crucifixion, as described in the gospel of John. This ambitious passion-oratorio was written in 1724 during Bach’s first year as Thomaskantor in Leipzig. Led by artistic director Julie Andrijeski, the Atlanta Baroque Orchestra will perform on period instruments in an historically informed style and will join the Hodgson Singers. Additionally, a new portativ organ, a small chamber, pipe organ used to provide harmonic foundation in the continuo group of a baroque orchestra, has been donated to the school and will be used for the first time at this concert. “The length, dramatic scope and technical demands of the work lend to the auspiciousness of the event,” said Daniel Bara, the John D. Boyd UGA Foundation Professor of Choral Music and the director of choral activities at the Hugh Hodgson School of Music. He adds that since Bach’s music is among the most specialized and virtuosic in the repertoire, they also are welcoming several professional singers to collaborate on this performance, including UGA voice alumnus Derek Chester as the Evangelist. Chester will be joined in the performance by several other professional soloists including Emily Noel, soprano; UGA’s Elizabeth Johnson Knight, mezzo-soprano; Kyle Stegall, tenor; and Paul Max Tipton, bass. The role of Jesus will be sung by DMA student Washington Isaac Holmes, and the role of Pilate will be sung by MM choral conducting student Eric Newell. Adding to the roster of instrumentalists will be several UGA players, including Ruth Monson and two graduate student violinists who received special coaching by ABO players. “I’m hoping this can be one of the landmark concerts of the year at the Hodgson School, as it celebrates the talents of our faculty and student soloists, Hodgson Singers and our alums, and places our school in great company as a program that tackles the significant works of our field at a professional level, with performances that are at once stylish, dramatic and accessible,” said Bara. The concert will take place at 7:30 p.m. in Hodgson Concert Hall at the Performing Arts Center. Tickets for the concert are $20 for adults and $12 for students and can be purchased by phone at 706-542-4400 or online at pac.uga.edu/event/uga-hodgson-singers/. All proceeds directly fund student scholarships. The Hodgson Singers and Atlanta Baroque Orchestra will perform the same concert the following evening as part of First Presbyterian Church of Atlanta’s free Concerts @ First Series. For those unable to attend either event, the Thursday performance will be streamed at music.uga.edu/live-streaming.